What’s more fun than experimenting with food? Getting awarded for it. Area high school students got a chance to explore the world of culinary arts recently and learned how to make foods such as buffalo ribs, crepes and cupcakes. Photo by Jenny Kirk Yellow Medicine East’s April Rodriguez put the finishing touches on her cupcakes during one of the cake decorating competitions at SMSU. 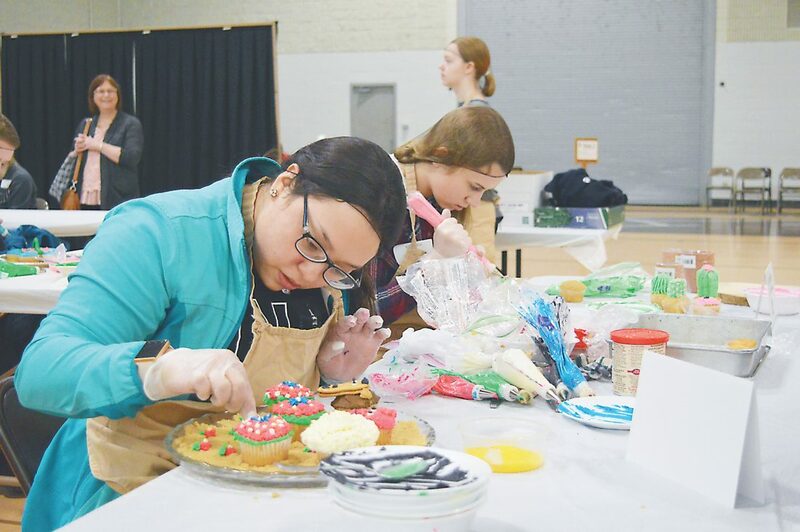 High school students from around the region had plenty of opportunities to learn and compete recently at the 2019 Schwan Culinary Skills Challenge at Southwest Minnesota State University. 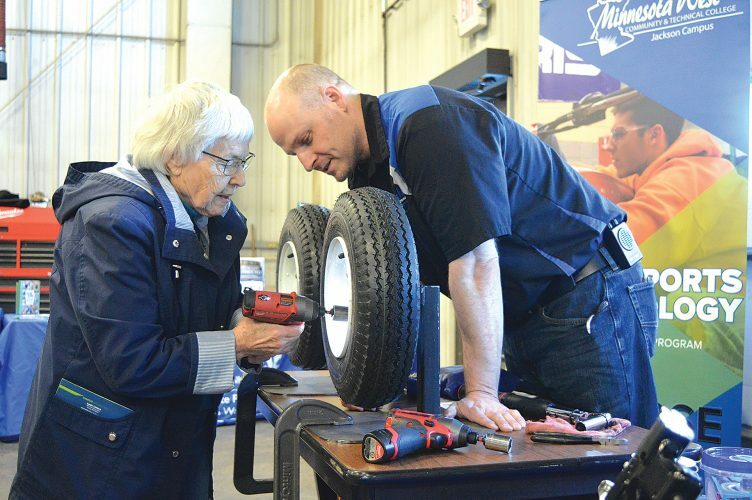 More than 200 students attended the 15th annual event, either challenging themselves in the eight different competitions or taking part in the various sessions presented by industry professions — or oftentimes, doing both. Lakeview students Lucee Olson, Carly Kosel and Heidi Okseter had positive things to say about the experience. Kosel said she especially enjoyed touring the culinology department, where they also had the chance to make custom-flavored Dippin’ Dots. Okseter, a foreign exchange student from Norway, was quick to highlight her two favorite sessions. Okseter said she also enjoyed sampling an Indigenous American and East Indian fused dish prepared by Chris Murray, a regional chef from Taher Foods. Mixed in with the red curry encrusted buffalo short ribs was coconut braised bok choy. Polejewski said Hy-Vee chef Stevie Content’s sushi session was a really popular one. 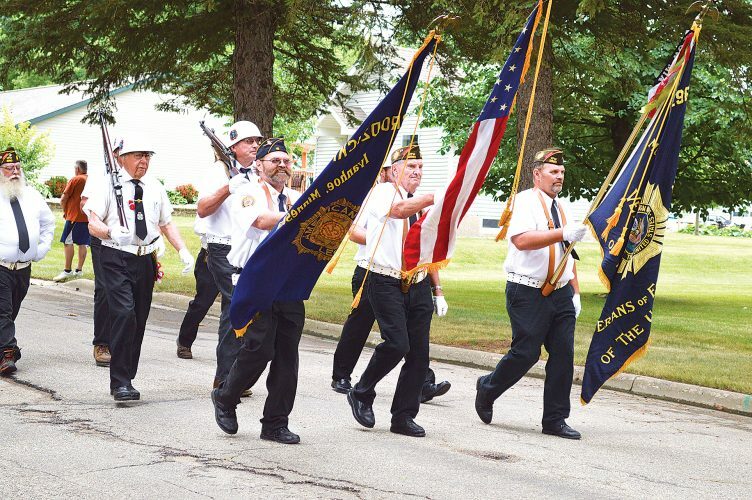 “You had a lot of kids who had never had it before and you had kids who have had it, but didn’t realize how easy it is to make,” Polejewski said. Taher executive chef Chris Loew demonstrated fruit and vegetable art, while Taher chef Eric Rudelius made homemade pasta with the students. The cheese omelet session was presented by Brian Renz, a corporate chef with Taher. Family and consumer science teacher Janet Opdahl brought 26 students — all seniors — who are in her foods class at Murray County Central. She added that most of them had really been looking forward to the event. 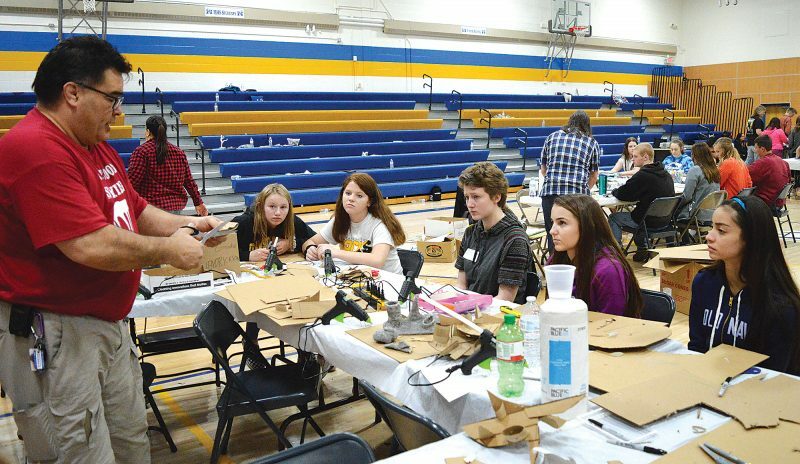 Opdahl said most of the MCC students were signed up for several sessions and that three of the students were participating in different competitions. Three cake decorating challenges were among the nine different competitions that took place throughout the day. Russell-Tyler-Ruthton freshman Cari Baune participated in one of them for the first time. Yellow Medicine East student April Rodriguez used vibrant colors to decorate her cupcakes. Early on, judges Robin Bednarek and Shelly Block were curious about her decision to use brown sugar. “Since I had the flowers and grass, I thought I’d add (the brown sugar) for the ground they’re on,” Rodriguez said. Other competitions included: knife skills, baking science, culinary, menu design, food art and place setting/napkin folding. Along with other sessions, there was also a food trivia event. Lunch was prepared and served by members of the SMSU Student Hospitality Opportunities. Marshall FACS teacher Kris Campion said she brought a lot fewer students this year because of scheduling conflicts. Campion said she appreciates the opportunities that students have by attending the Culinary Skills Challenge. “It’s really cool,” she said of the event. YME’s Alli Steffen won the cake decorating – cupcakes competition, while MCC competitor Celeste Aamodt took first place in place setting.